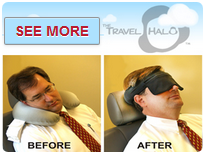 The Travel Halo was created with one goal in mind: to make it possible to sleep comfortably while sitting up. Whether you travel by plane, train, or automobile, the Travel Halo’s unique design will help you sleep better. The Travel Halo retails for the very reasonable price of $14 (considering its exceptional materials and brilliant design). Read Travel Halo reviews for some of the great things travelers are saying. The Travel Halo is super compact and is easily stored in its carrying pouch when not in use. Unlike those bulky u-shaped travel pillows the Travel Halo can fit in your pocket and only weighs 2.5 ounces! Travel-Zombie syndrome (TZS) is a common condition brought on by long periods of travel in uncomfortable positions with no sleep. TZS can have detrimental effects on both business & personal relationships.